The GC98FF Modular Adapter features a DB9 female connector and an RJ45 female connector. Used for modular RS232, RS422 and RS485 connections, the adapter converts your DB9 male connection into an RJ45 female connection. The adapter allows for custom serial pin out configurations. 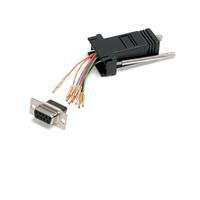 The DB9F/RJ45F adapter is backed by lifetime warranty, guaranteeing long-lasting durability. What is the difference between a straight-through and null modem serial cable? A straight-through serial cable is the most common type of serial cable, used to connect a Data Terminal Equipment (DTE) device (for example, a computer) to a Data Communications Equipment (DCE) device (for example, a modem). The pinout of the serial connectors on both sides of the cable are exactly the same with a straight-through serial cable. A null modem serial cable (frequently called a crossover cable) is used to connect two DTE devices together without the use of a DCE device in between. For this to happen, the Transmit (TXD) and Receive (RXD) pins on one of the serial connectors are flipped. To confirm the type of serial cable that is required for your device or configuration, refer to the information provided by the manufacturer.